We are crapping our pants with excitement over each of these readers. The picture above is from a woodcut. A woodcut of skyscrapers. Deal with it. 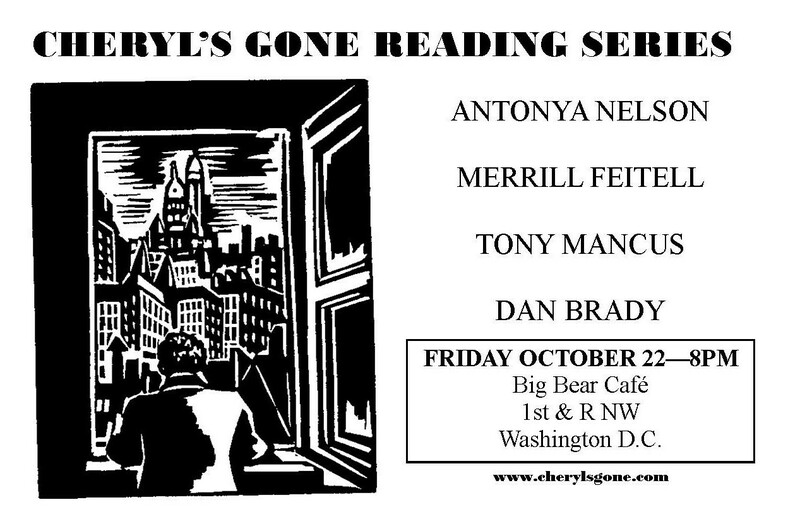 Come to the reading. Antonya Nelson is the author of four novels, including Bound (Bloomsbury, 2010) and six short story collections, including Nothing Right (Bloomsbury, 2009). Her work has appeared in the New Yorker, Esquire, Harper’s, Redbook and many other magazines, as well as in anthologies such as Prize Stories: the O. Henry Awards and Best American Short Stories. She is the recipient of a USA Artists Award in 2009, the 2003 Rea Award for Short Fiction, as well as NEA and Guggenheim Fellowships, and teaches in the Warren Wilson MFA Program, as well as in the University of Houston’s Creative Writing Program. She lives in Telluride, Colorado, Las Cruces, New Mexico, and Houston, Texas. Tony Mancus lives in Rosslyn, VA with his future wife and two cats. He teaches writing at GMU, Emerson Prep, and with Writopia Lab DC. In 2008 he co-founded Flying Guillotine Press with Sommer Browning and since then he’s been making short runs of hand-bound books. Some of his ramblings and links to published poems can be found at inlandskirting.blogspot.com. Merrill Feitell’s first book, Here Beneath Low-Flying Planes, won the Iowa Award for Short Fiction. Her stories have appeared in such publications as Best New American Voices and VQR’s special issue: Fiction’s New Luminaries, and have been short-listed in both Best American Short Stories and The O. Henry Awards. She is on the MFA faculty at University of Maryland in College Park and is Fiction Editor for Forklift, Ohio: A Journal of Poetry, Cooking & Light Industrial Safety. She lives in Baltimore.